Foodies are a special breed of people. They are the type who understand and appreciate the finer things in life, and are willing to go to great lengths to enjoy them. If you’re a foodie, or you happen to know a foodie, then you’re going to want to check out this list of must-have luxury items. These are the kinds of items you didn’t even realize you needed until you get them, and then you’ll wonder how you managed without them! Any foodie will tell you that the secret to great dishes is using fresh and fragrant herbs. Why not make it easy for the foodie to do this with the Chef'n herb stripper. 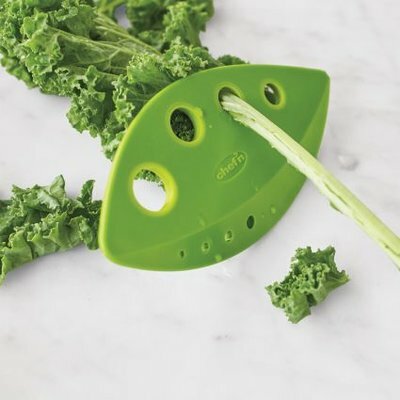 This little gadget allows you to strip the leaves off various herbs and kale in just seconds. The herbs can then be used in dishes or as garnish. It will become the foodie’s favourite gadget in the kitchen. You don't have to be a foodie to appreciate hot chocolate, but we all know that not every hot chocolate is made equal. If you want to ensure that perfect taste and consistency each and every time, then the Bialettie Hot Chocolate Maker is the way to go. This little device is able to make Italian style hot chocolate that is the right temperature and consistency each time. It can be used with powder or syrup and you'll get the same great results. Subscription boxes are all the rage at the moment, and foodies are taking part in the trend. Wine subscription services allow you to set up delivery for a whole year giving the recipient something new to look forward to each box. This is a great way to discover new favourites and play around with food and wine pairings. Mushrooms can be found in some of the tastiest dishes, but cleaning and then cutting them up can be a real pain. The Opinel Mushroom Knife is meant to make preparing fresh mushrooms a breeze. The one end features a boar-hair brush, while the other end is a curved blade with a serrated edge on one side and a sharp one on the other side. This means you can clean, peel, and cut the mushrooms with one tool. If you happen to be looking for gift ideas for the foodie in your life, you can always check out these British Fine Food luxury food hampers. The hampers feature a collection of British artisan products, many of which are award-winning. You can pick from a variety of themes or create your very own basket that will put a smile on the face of the foodie in your life. Luxury items for foodies are all about being imaginative and thinking outside the box. It’s about providing the foodie with a unique tool, a fabulous new flavour, or something fun to use.